progress in HISTORY. ACCESSIBILITY options are offered for VISUALLY impaired and those struggling with fine motor skills. Names of letters are narrated (NOT phonics). User can create his own spelling lists by typing any word and recording his voice. The recording time offers user a chance to record a word and a sentence as a prompt in recognizing the right word. The recording time can be shortened in case the narration consists of only one word without an accompanying sentence. Teachers/parents can SHARE customized spelling lists among other iPad users via e-mail. You can track students’ progress in HISTORY. ACCESSIBILITY options are offered for the VISUALLY impaired and those struggling with fine motor skills. 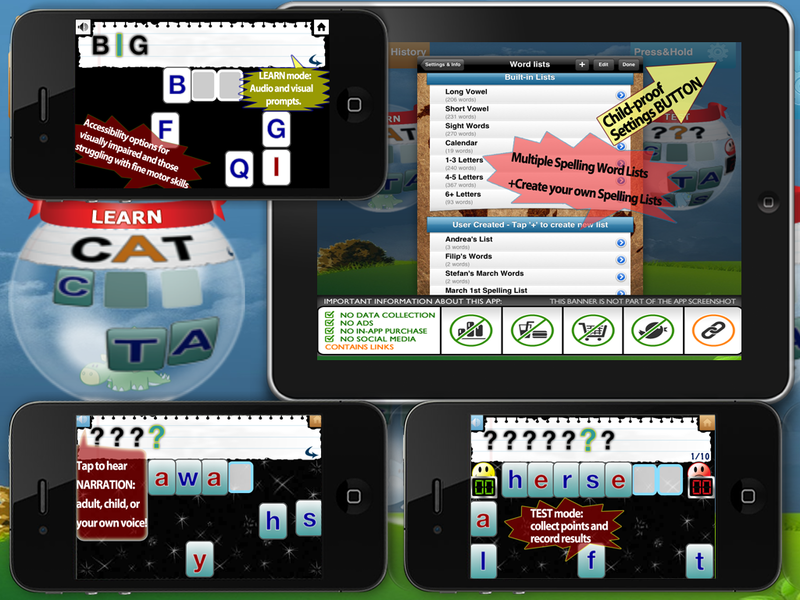 The EXPRESS spelling app is a lite/free version of the previous two spelling apps. It was designed as a sample app for users to try the app first and then decide if the teaching methodology in the app works for them. Later in-app purchase option was added due to changes on the iTunes market. The Express version offers some features for FREE. In the case of customized spelling lists, only the names of letters are narrated during practice, while other preloaded (built-in) spelling lists can have either name of the letter of sound of the letter narrated. Classroom Spelling App represents a full version of Build A Word Express App (Build A Word Express – Practice spelling and learn letter sounds and names). This means that these two apps are identical except that with Classroom Spelling all the features unlocked with the initial purchase. The app was created to help schools make educational purchases since such purchases cannot be made through in-app purchases within the Build A Word Express App. This app was designed as a sample app for users to try it out first and decide if they wish to buy the full version. The in-app purchase was added later due to iTunes store changes.